On January 10, 1642, King Charles and his family made their way to Oxford in fear of their lives, as the English Civil War commenced leading to the eventual execution of the King in 1649. Charles was the son of James VI of Scotland, who became King of England when Elizabeth I died in 1603. Charles became king in 1625, and three months later married Henrietta Maria of France. They had five children and enjoyed a very happy union. Though things were happy for Charles on the home front, from the very beginning of his reign it was one headache after another. His good buddy George Villiers, Duke of Buckingham, was universally detested by the rest of the nobility for being a weasel of epic proportions, and he was assassinated in 1628. Charles and Parliament were also constantly at odds over money. Debt was growing at an astronomical rate. 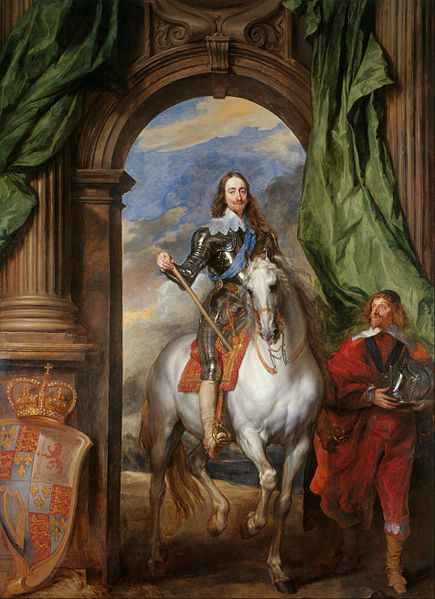 The Stuart monarchs were not known for their thrift, and Charles I was especially extravagant. Works of art by Raphael and Titian and foreign wars do not come cheaply after all. A more ominous concern was the religion of the Queen. Catholic plots against the life of Elizabeth I and Guy Fawkes’ antics were still fresh in England’s memory, so the King’s choice of a bride, though personally rewarding, was politically questionable at best. Between 1625 and 1629, Charles dissolved Parliament a total of three times. In 1629, he went so far as to dismiss Parliament with the intention of ruling alone. This was a very unpopular move. Further, it was necessary for the King to raise taxes in unorthodox ways such as wardship, forest laws and forced loans. These tactics made his subjects that might otherwise have supported him turn against him. Then in 1637, Charles imposed a High Church liturgy book that caused rioting in Edinburgh, forcing the King to recall Parliament, ending his solo rule. Things got even trickier in November 1641 when tempers flared over who should handle an uprising in Ireland. By January 4, 1642, Charles was fed up and ordered that five members of his disagreeable Parliament be arrested. When that didn’t work out quite as he had hoped, he headed for the safety of Oxford on the 10th. By August of that year, the Civil War was in full swing. Charles surrendered to the Scots in 1646, who in turn delivered him to Parliament. He escaped to the Isle of Wight a year later, but this “Second Civil War” was over before the year was out thanks to Parliamentarian General Oliver Cromwell. Noting the King’s ability to escape and his ability to muster Loyalist troops, a group of radical MPs decided he would always be a danger while he lived, and Charles was put on trial for treason. He was found guilty (no surprise there) and executed on January 30, 1649. Interesting…he became king in 1625 and was beheaded in 1949. The problem is not in “often mak[ing] that same typo.” Rather, the problem is in not employing a competent copy editor, who would have noticed, and corrected, such an error before it could be placed before the public. Precious minutes that should not have been lost were in fact lost by Dave, Daven, and me in “discussing” this matter. Something should be done by those who control TIFO to prevent recurrences of such wastes of time. A new copy-editor (known to many as a proofreader) is needed (1) to fix all previously published TIFO pages and (2) to review and correct all not-yet-published pages. @J.F. Gecik: I’ll just go harvest some money from my money tree and get right on hiring said copyeditor. 😉 Truthfully, though, I am working on some alternate revenue streams besides ads to help make such money available. But unfortunately the ad-based model takes ridiculous amounts of visitors per article even to make $1, something most people don’t realize. (In fact, most articles on TIFO take many years to actually make a profit as it is.) Good copyeditor’s also aren’t cheap. (I’ve looked.) So presently if I turn up the typo-catching lightbulb, that means turning down other lightbulbs, like fact checking- essentially having to hire cheaper authors who aren’t as good at research. Obviously for a site like this, getting the facts right is much more important than catching typos. When more money becomes available, of course, then we can get the best of both worlds. But we’re not there yet.